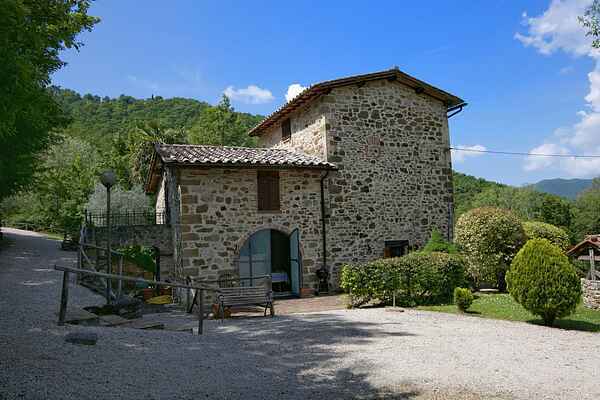 On this estate with 2800 sqm garden, located in the Niccone valley on the border with Tuscany and Umbria, there are 2 holiday homes and a private swimming pool. It's a great place to spend a holiday because it is a combination of beautiful landscapes, castle ruins, vineyards, olive groves, hills and forests. On the property is a spacious garden and a swimming pool and overlooks a beautiful lake. can rest in the spacious garden and read a book and you can dine on the terrace and sip a glass of local wine. Both houses have been completely renovated while maintaining its terracotta tiles and wooden beams on the ceiling. The houses are rustic and comfortable, and very cozy. The Niccone valley is a central base for towns in Umbria and Tuscany such as Florence, Siena, Cortona, Assisi, Arezzo, Gubbio, Perugia, Deruta, Montefalco, Spoleto, Spello, Todi, Montepulciano, Pienza, Siena, Umbertide, Città di Castello, Sansepolcro. 3 km away is the village with a supermarket, shop and restaurant. Lake Trasimeno is 20 km away.